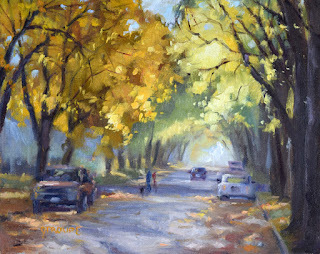 Winter is starting to set in so I wanted to share a collection of plein air paintings from around the Valley and Glacier Park during the brief window of spectacular color called Autumn. It truly is a stunning place all year around, but when the aspens turn gold, followed by the larch trees, words cannot describe the beauty. Painting people's homes is very rewarding a quite a unique artistic challenge. The personality of the occupants has to be evident in the painting. I use lighting carefully to highlight my focal point in the painting and also spend more time there creating small detail. The peripheries of the painting generally have less contrast, detail and less sharp edges to really focus the viewers attention where I want it. In the case of these two works, the porch/ patio areas are the star attraction with pops of color of the flower beds and long shadows leading your eye in. Last Friday, the 23rd of February, the Grouse Mountain Lodge in Whitefish held the ‘Wedding for Wedding Vendors’ party. It was a well planned event in which all the members of My Montana Wedding attended which was made to feel like a wedding reception. 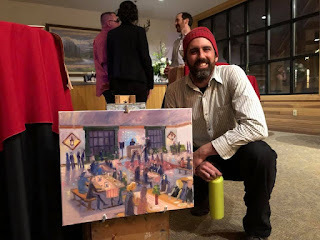 I took the opportunity to showcase my Live Event Painting services and completed a medium sized oil painting of the event (16”x20”) in a little over three hours. I wanted the other wedding vendors to see me in action so they could recommend my services to their friends and clients with confidence. My primary goals in painting live events and wedding paintings is to get a good overall feel of the scene, with its energy mood and scale. I do this by not focusing too much on details like facial features but focus on larger shapes like groups of people, rows of banquet tables and prominent architectural details. 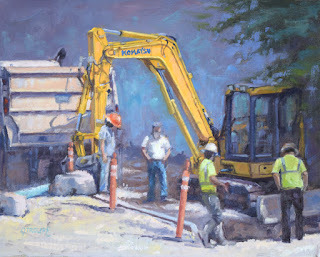 I focus on creating interesting lighting in my paintings and the lines of action in my figures and people in the scene. I like to interact with interested party goers and provide some entertainment as they see the painting progress and take shape. I am happy with how this painting turned out and I enjoyed the process from start to finish. Grouse Mountain Lodge Party 16"x20"
This is a three step progression of my most recent painting, 'From the Shores of Kintla' 15"x30". The shores of Kintla Lake offers a stunning view on a picture perfect summer day. It lies in the northwestern most reaches of Glacier Park and requires traversing about 40 miles of gravel and dirt roads along the North Fork of the Flathead River. Just getting there is an adventure I highly recommend. On a 10 degree December day in Glacier National Park, The last bit of daylight caused the peaks surrounding Lake McDonald glow. This is a rare sight in winter at Glacier National Park where cloud cover is the norm so my wife and I were thrilled to see this vista on Christmas Day 2017. The bands of light peeking through the clouds created a stunning effect that was truly inspirational. It was too cold to paint on location, but I got a lot of good photo reference so I could create a painting back in the studio. I have had this 3:1 ratio canvas hanging around the studio for more than a year just waiting for the right subject matter. This was it! Lake McDonald lends itself perfectly to panoramic compositions with its looming pinnacles extending to the periphery of one's view. 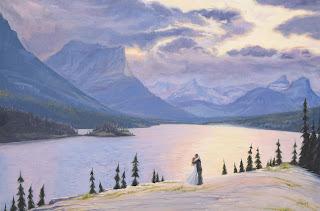 Apgar Winter Panorama, oil on canvas, 11"x33"
Outdoor weddings are becoming increasingly popular as so many people have a love for the outdoors. This love of the outdoors is something that the vast majority of Montanans have in common with our two iconic National Parks and endless wilderness areas. Many couples have a special connection to a specific place which brings back special memories such as a special weekend trip or engagement. These special places are a great choice to get married at as the couple can share this place with family and friends. Outdoor weddings lend themselves perfectly to oil paintings. 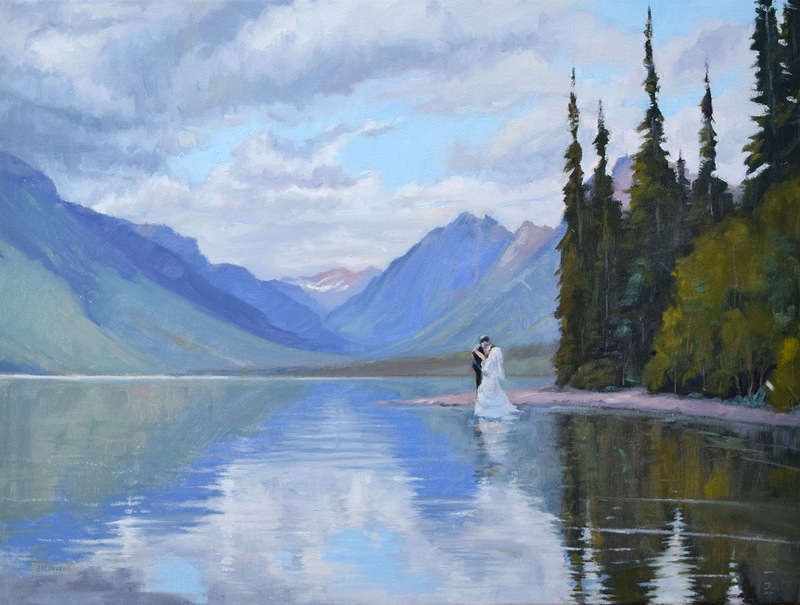 The bride and groom dressed in their best surrounded by a vast dramatic landscape provides the makings of a beautiful oil painting that can capture the moment unlike any other way and will be a timeless memory to adorn you walls for years to come. I finished up Lake McDonald Wedding this week. It was my demo piece that I worked on at the My Montana Wedding Expo. It needed more detail in the water as well as on the bride and groom and the clouds needed some color modification. I am pleased with the overall effect. 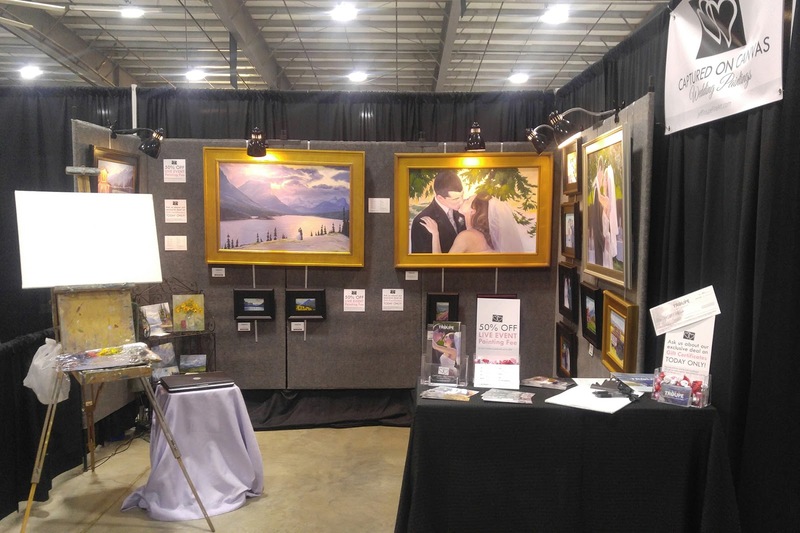 Patti and I had a great time this past weekend at the My Montana Wedding Expo. The paintings looked great hung up on the pro panels and lit with basic desk clip lamps purchased at Walmart for $9 a piece. They did the trick nicely and much more economically than their LED counterparts. The hanging system consisted of aluminum strips with a 'U' shape bend at the top so they could hang over the top of the pro panels. Small holes were then drilled every inch of the strips and 15 pound limit 'S' hooks were inserted where ever I wanted to hang a painting. I hung the larger paintings on 2 aluminum strips as those paintings had 2 hanging wires. Thanks to Bob Marceau for his great set up idea. 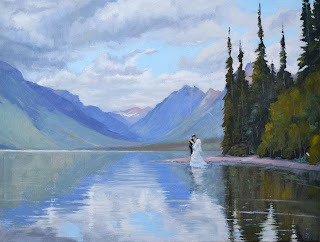 I also painted an 18"24" painting during the expo of a bride and groom on the shores of Lake McDonald. Attendees of the expo really enjoyed watching me paint and it really helped us to make a lot of connections. 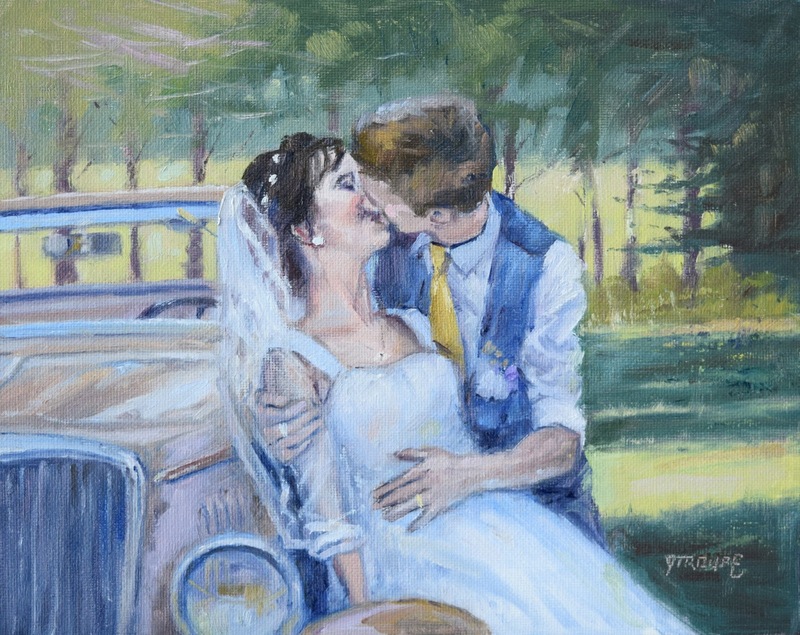 We are looking forward to a busy spring and summer with our live wedding painting service and wedding portrait painting. Check out the pictures of our set up and the images of the painting in progress below. Jeff Troupe Fine Art is getting ready to formally launch our 'Captured on Canvas' wedding painting campaign. The official launch date is January 13th 2018 at the My Montana Wedding Expo at the Flathead County Fairgrounds in Kalispell. I have been busy in recent months completing small portrait commissions to begin to assemble a striking portfolio of work. However, in the last few weeks I have spent time on three large show pieces that I hope will be very eye catching and dramatic. My wife Patti and I were the subjects of these works in which I worked hard to capture the connection between the couple, dramatic lighting, likeness, and small details such as the bride's hairstyle and jewelry. 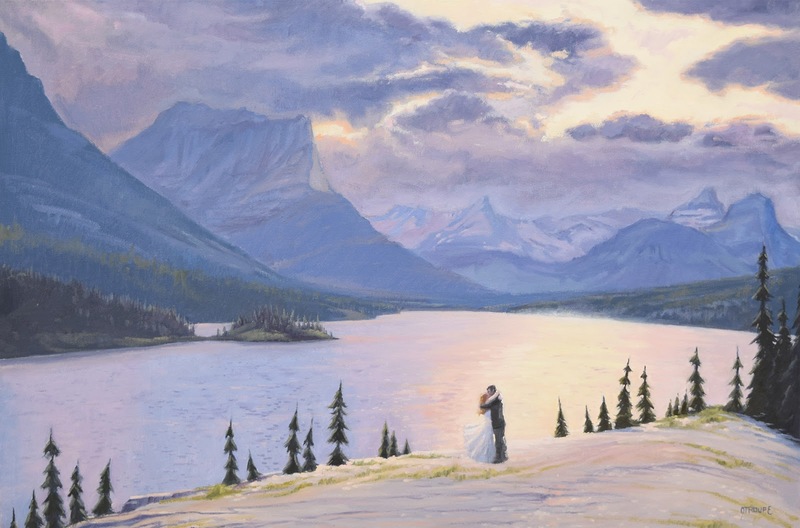 In the 'Sun Point Wedding' painting, I added Patti and myself as a way to demonstrate our 'bride and groom in the landscape' option that we will offer to our clients. Sun Point at St. Mary lake is a popular place to get married and is a stunning vista. It was a lot of fun revisiting our wedding pictures and spending so much time creating large works of Patti and myself. It was a great way to relive the event which took place over 10 years ago and reflect how truly blessed I am and how I love Patti even more today. 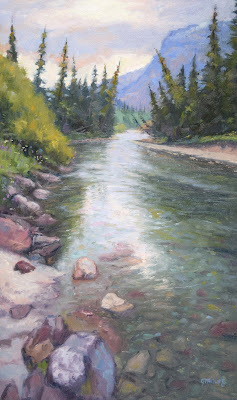 My solo show, Whitefish and Glacier en Plein Air, took place at the Walking Man Frame Shop and Gallery during the month of June 2017 in Whitefish Montana. This post includes all of the new work that was featured in the show. Whitefish is a charming ski village at the foot of Big Mountain Ski Park and is very picturesque. Its culture is strongly interwoven with Glacier National Park and is a great starting point for adventures into the park. I was working on the show in the spring so much of Glacier National Park was not open. So I created a few studio works based on previously painted plein air works to round out the show, such as 'The Ski Village' and 'North Fork Last Light'. We had a successful show and a great time at the opening reception. Many of the works are still available at the Walking Man, so stop in today. 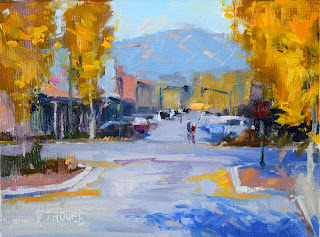 Fall comes to Whitefish - Original Oil Painting 6"x8"
Fall is my favorite season here in the Flathead Valley and in Glacier National Park. The summer heat has subsided and there is a little crispness to the air. I also love the vibrant yellow and gold of the aspens that peak first, and the rustier gold of the tamaracks (which have needles like a pine tree) which peak in late fall. You really have to take advantage of this time as fall is very short and winter sets in quickly. 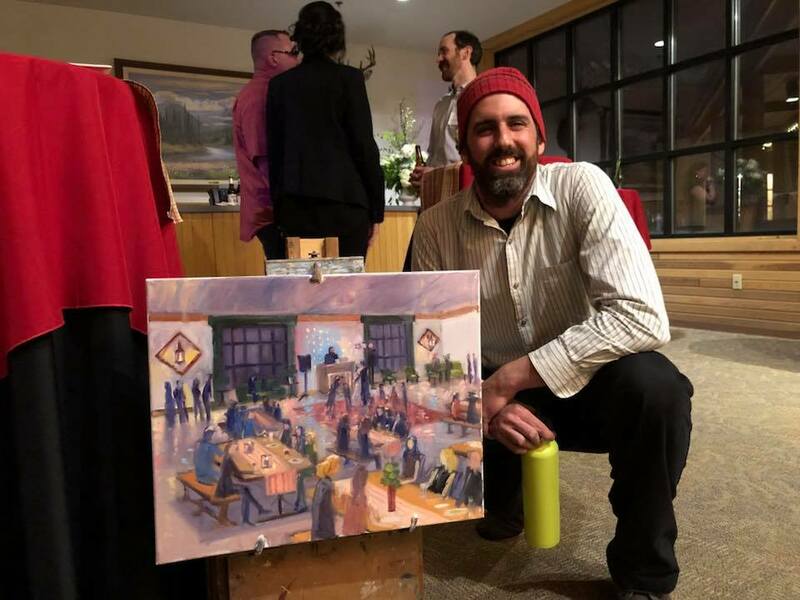 I was fortunate enough to have the opportunity to do several plein air paintings at the Diamond B Weddings and Events ranch in lower valley just south of Kalispell. It has sweeping views of the Swan mountains, is situated right on the Flathead River, and has barns and old trucks to paint as well. It is a plein air painters paradise. I am going to display around 10 of these paintings at the Diamond B next year so people having weddings there will have an opportunity to purchase them. Now that winter is here, I still plan to get out there and do some on location painting, but it is a really good time to focus on commission pieces and larger studio works like the piece 'Rocky Shoreline' which is a commission piece of beautiful McDonald Creek in Glacier National Park. 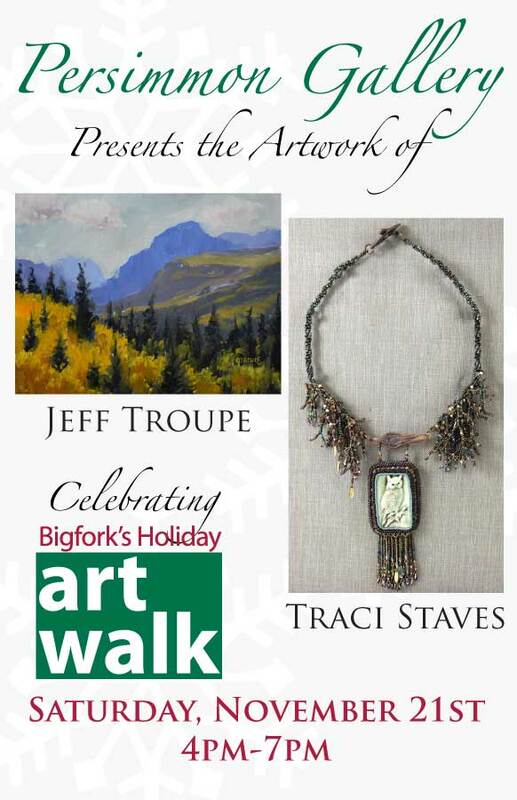 a Montana artist has to roll with the punches that the season dish out. Fall is a great time to paint the historic homes on the East Side. The leaves of the maples that line the streets turn a vibrant yellow orange and create stunning golden tunnels. The leaves that fall to the ground add additional color and texture which is fun to render. The dappled light is fun to paint and there is usually some color left in the flower pots and garden beds. I painted two commission pieces this fall for East Side residents and I plan pain more next June when the flowers are bloomed and the trees have regained their lost foliage. In the mean time I hope you enjoy these fun little house oil paintings. These 12 paintings represent my experiences during the Hockaday Museum Plein air 2017 event which included about 30 painters from the western US and beyond painting in Glacier National Park and the Flathead Valley. 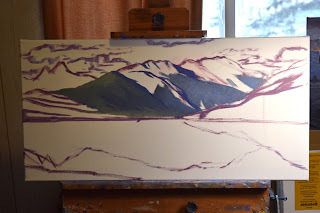 The chief Mountain painting was painted in the studio after the event but all the others were painted in plein air. I spent much of my time on the Middle Fork of the Flathead River which runs along the southern border of Glacier Park. The fall color there was peaking and the light was perfect. It was a great place to set up shop. My demo piece I painted at the Hockaday today. 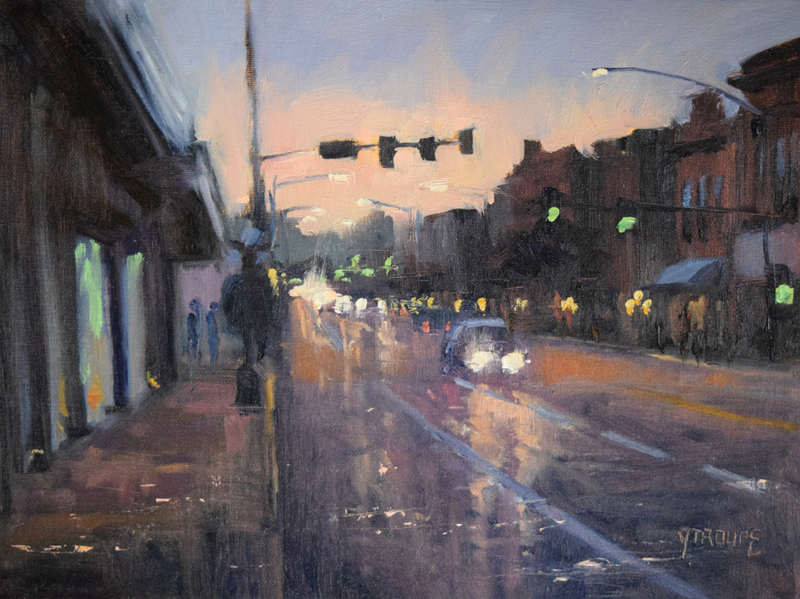 It is called 'Downtown Sparkle' 9"x12"
It was a lot of fun with a great turnout and a great group of art lovers who asked great questions. This was painted in a tad over 90 minutes. 'downtown sparkle' oil on canvas 9"x12"
The opening reception for my two man show at the Hockaday Museum with B Rex Stewart was a success. I have sold three paintings thus far, two of which are large works and Rex has sold several as well. 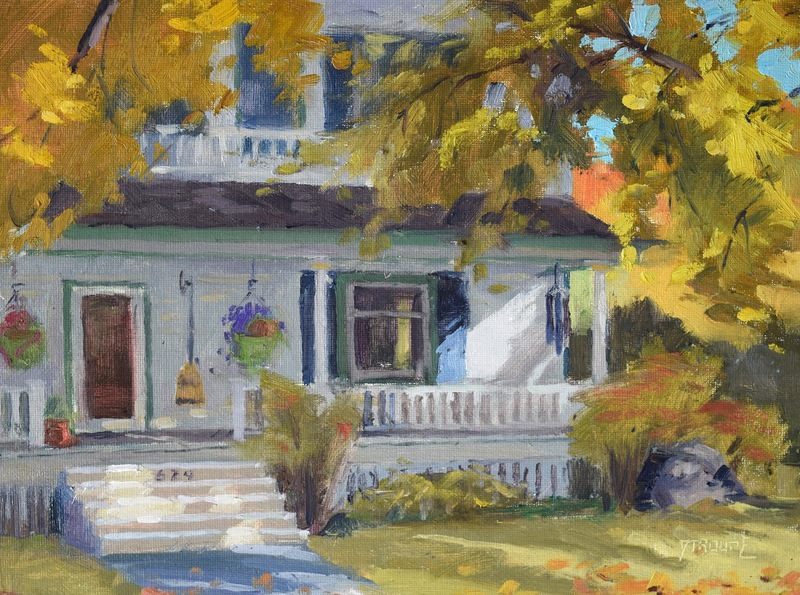 The show is titled, 'Flathead on Canvas:Small Town Charm to Country side Splendor'. This has been a labor of love for the past year to get together a solid body of work that I feel is my best yet. I am so very excited to see them displayed in such a top tier venue. Unlike previous shows, I will have several large studio works in addition to small plein airs. The large works really have a presence and take you into the scene. This is a big honor and I am feeling very blessed to have this opportunity. I have 40 works on display. These are the larger works that I created in the last months before the show. 'A Warm summer Evening: Kalispell' oil on canvas 24"x30"
Winter came suddenly and everything is covered in a beautiful white blanket of white snow. This is a fun season to paint in Montana... if you bundle up. 'Little Mountain Village' oil on canvas 6"x8" The little Montana hamlet of Bigfork slows down a little bit in the winter, but is still a cozy place to spend an evening out. It is a truly charming place with its street lamps aglow and awnings covered in fresh snow. 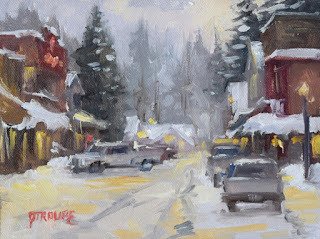 After painting this I enjoyed a hot cup of soup at Show Thyme restaurant with the Bigfork couple who purchased this work. That was a welcome surprise and made the evening very memorable. The transition from fall to winter happens quickly in Montana, so I was very thankful to get a few last paintings of the season with the great vibrant fall color. And now winter is here which is a truly beautiful time of year and fun to paint... as long as you bundle up. 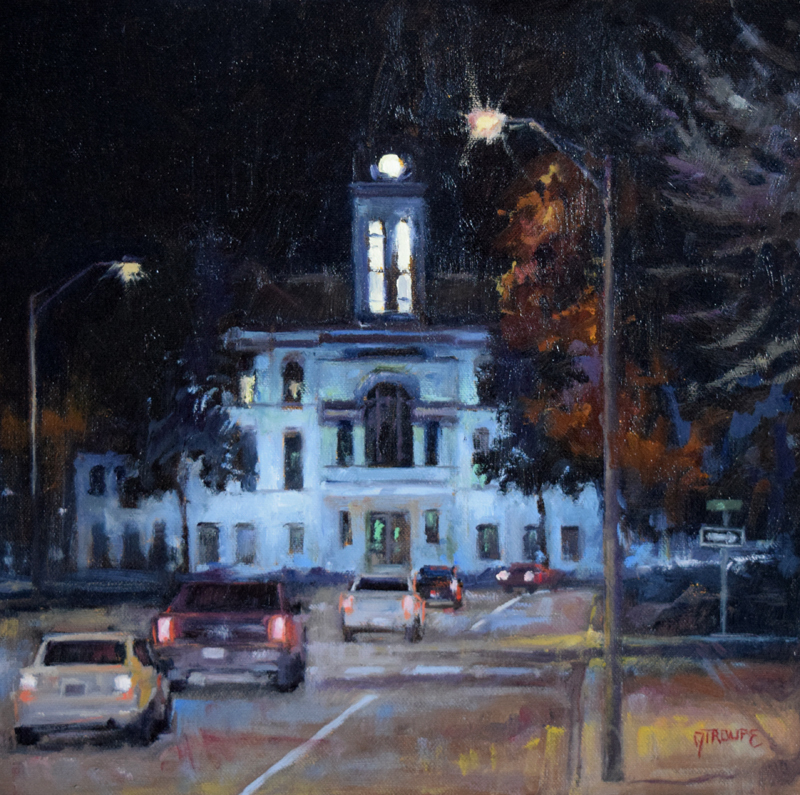 'Couthouse Glow' oil on canvas 11"x11" The Flathead County Courthouse is one of my favorite buildings in Kalispell, especially all lit up at night. We took a little trip down to California this month to visit family and friends. We spent three days (far too short) in Alturas California, where Patti and I lived for almost a year in 2014, before heading down to the Bay Area.. It was really great to visit and see all the places we frequented in Alturas. 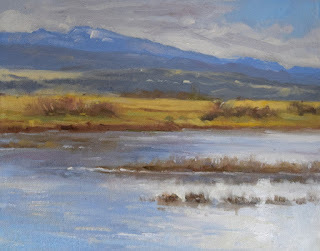 It is truly a hidden gem in California and an inspirational place to paint. 'Eagle Peak Reflections' oil on canvas 8"x10" The highest peak in the Warner range provided a great backdrop to the wetlands in the Modoc wildlife Refuge. I've had to adapt a little bit this month as we got nearly 5 inches of rain in the Flathead Valley which is about five times the normal amount. I painted a few studio works and was able to sneak out and capture some of the fleeting fall color in between down pours. 'An Evening Out' oil on canvas 11"x14"
Here is another preview painting for the two man show at the Hockaday in Kalispell early next year. 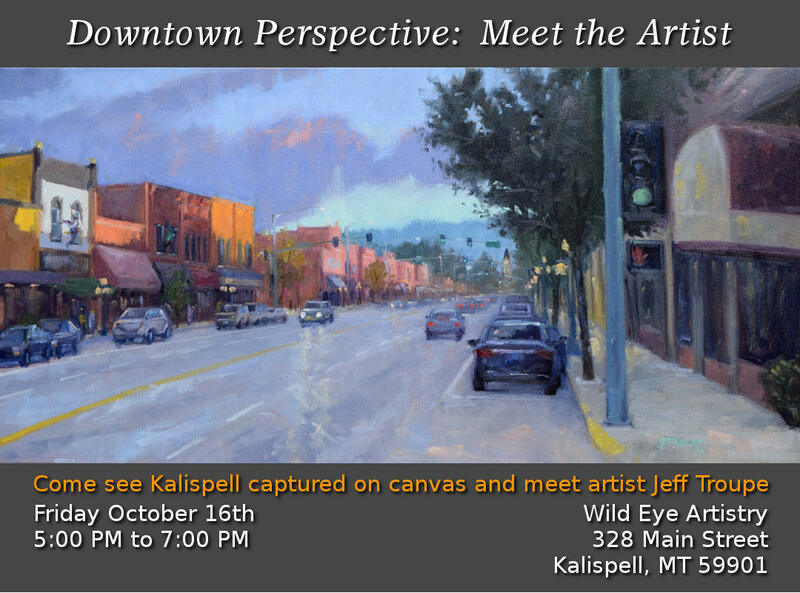 I will be creating a series of nocturne city scapes of the towns in the Flathead Valley as a subset of the show. Here are all of the paintings I completed while in Roseburg during the Umpqua Plein Air 2016 event. I stayed at the Valleys end guesthouse in Umpqua, just 10 miles north of Roseburg. My host Kevin made me feel very welcome. The guesthouse sits on 30 acres in the midst of rolling hills and is situated right next to the umpqua River. I was in Roseburg 5 days and completed 12 paintings. The paint out was two days (sep 15-16) with the quick draw and dinner on the 14th. The opening reception was saturday the 17th. I was able to submit 2 works into the main competition one of which got the people's choice and theother got third overall. Submitted paintings had to be completed on official paint out days. A big congratulations to our 2016 Umpqua Plein Air award winners!!! It was quite an honor to win awards. It meant a lot to me and I hope to be back next year. Morning Reclaimed, Oil on Canvas 11"x14"
This old barn is located in umpqua at the valley's end guesthouse. Such a beautiful place to stay and great hospitality. This was painted during the first day of the paint out. A hint of Fall chill can be felt in the air and the leaves of the cottonwoods are beginning to show hints of gold, which foreshadow the wonderful fall display to come. The historic east side neighborhood in Kalispell becomes a truly special place when fall hits and turns the tree lined streets into golden tunnels. Summer in Montana is like no other place. The days are long, the temperature is not too hot, and the air is crystal clear. It is a plein air painter's paradise. The Classic View, Oil on Canvas 4"x6"
The shores of Lake MacDonald in Glacier Park provide stunning vistas of the surrounding peaks including Mount Brown and Mount Vaught and is one of the most recognizable scenes in the park. What perfect weather we had in Glacier Park during the four days that I painted. I stayed till the light dipped behind the horizon on two of the days and wound up creating 12 works, 3 of which sold the night of the reception. I stuck mainly to the Sun Road this year and focused my efforts on painting rather than driving. I felt I was more consistent this year and am pleased with the works created. Lake McDonald has been one of my favorite places to paint in the park and the way that the cloud cover created interesting light effect on the mountains made for some fun painting. I also discovered Avalanche Gorge a few weeks back and returned to capture its beauty on a couple of my canvases. If was really exited to see the work created by the 29 other participating artists and as good as the show was last year, I felt the overall quality of the show was even higher this year. 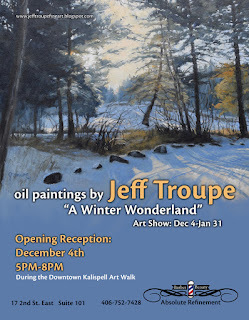 The unsold works are available for sale on my site: http://www.jefftroupefineart.com/originaloils.html Enjoy! A Rush to the Bridge:Avalanche Gorge, Oil on Canvas 24"x12"
The pine trees cling to the cliffs of Avalanche Gorge as filtered afternoon light funnels down through the tree tops. 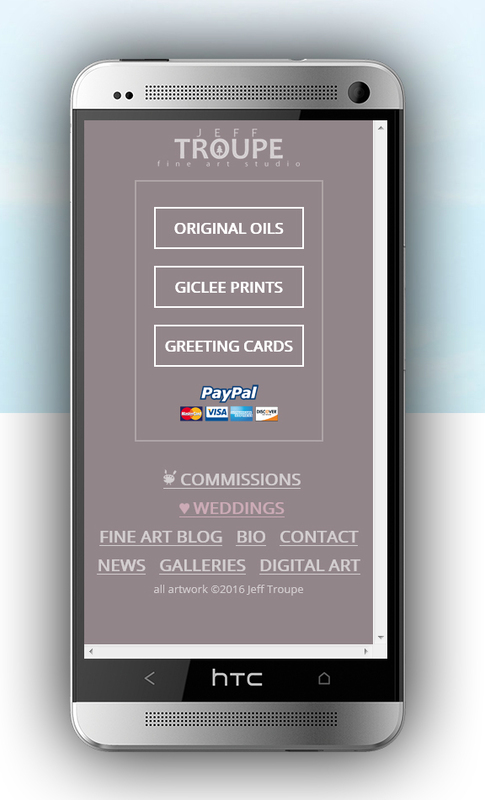 My official fine art website www.jefftroupefineart.com is now live and optimized for both mobile and desktop browsers. The site is an online store where users can buy my artwork directly through me via paypal. Also, users can commission me to create artwork for their wedding or other custom need. My blogspot blog will still be updated and will serve as a place where you can see all of my paintings including sold works and even sketches and thoughts. The summer days is Montana are quite long which offer ample opportunities for plein air painting. Late spring weather is also unpredictable which makes for a nice variety of lighting situations. 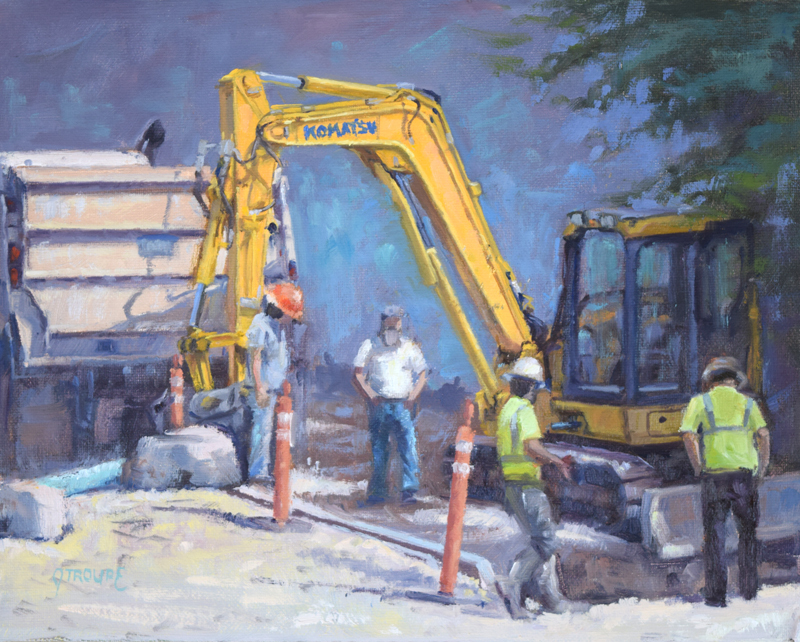 This construction site came to life in wonderful light and shadow as the arm of the excavator emerged from the shadow framing the foreman. With impossibly blue skies and temps in the 70's, it has been perfect plein air painting weather this last week in Montana. The Bride and the Groom, Oil on Canvas 6"x8"
The Bellevue Club is situated on the east end of picturesque Lake Merritt. It is a five story french style chateau with a stunning grand ballroom and even fine art inspired by Glacier National Park in the lobby. It is a great place to get married as my brother Kyle and his wife Samantha can attest to. Its late February in the Flathead Valley and already spring like weather is here. 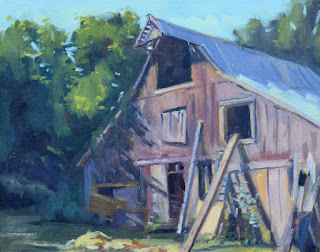 Its time to dust off the brushes and get outside again for some new plein air adventures. The Chamber: study, Oil on Canvas 6"x8"
This study was completed as reference for the larger painting 'The Chamber'. The staff at the Kalispell Chamber of Commerce commisioned the larger work for the 20th anniversary of their president. The light and shadow was fun to paint on this wonderful spring morning. 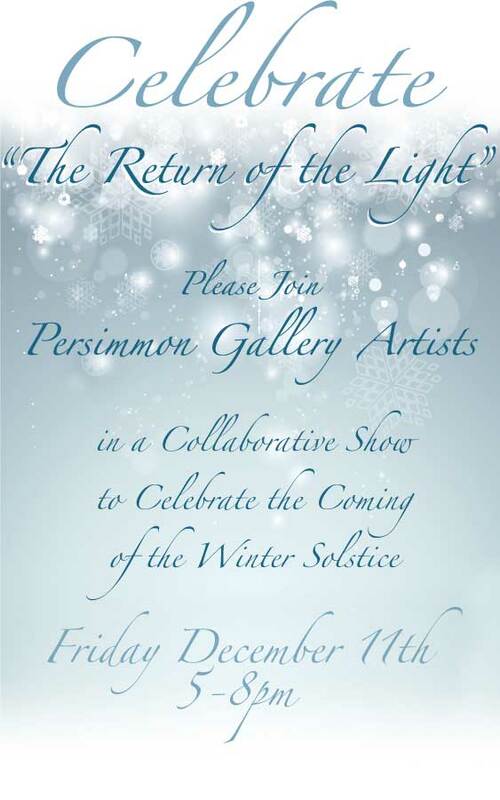 Come out to downtown Bigfork to check out Persimmon's winter show. I have a piece displayed in the show called 'Winter Ready'. There are endless Christmas gift options for everyone. 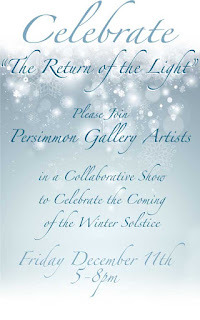 Come out and check out the show opening night December 4th. The show will remain up until February. 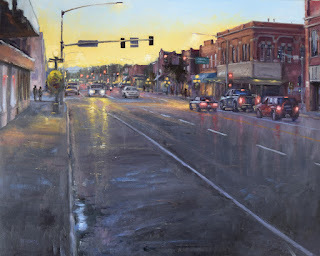 After the marathon of painting all the downtown businesses of Kalispell in plein air, it has been good to get back to the studio a bit and work on some projects that have been put on the back burner. It has also been fun to do some natural themed works after painting so many buildings. 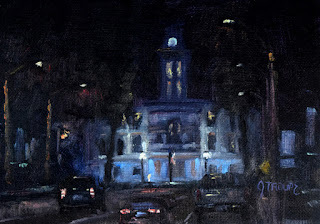 The Center of Town, Oil on Canvas 5"x7"
This is a smaller work that I have created in the studio recently for the Art Walk. The courthouse in downtown Kalispell is quite striking at night. Come out to Bigfork next Saturday as I will be the featured artist at Persimmon Gallery at will be there for the opening reception. There will be some nice new fall pieces. My first fall in the Flathead region has been a memorable one. The colors are truly amazing from the gold aspens to the yellow tamaracks. It has been fun to see the drastic changes from season to season. Flowers in the Wagon, Oil on Canvas 6"x8"
I created this little painting this morning to get the dramatic first light. It was a bit cold (about 30 degrees) But felt much colder in the wind. Finished up in the studio. It was around the middle of August 2015 when I began this project. 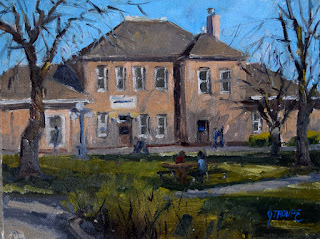 I had just recently began showing work at Wild Eye Artistry and had already painted a few of the local businesses and historical homes in Kalispell's East Side neighborhood. Rick, owner of Wild Eye Artistry, thought it might be a good idea to paint a few street scenes outside the gallery to engage people and direct them toward my work at the gallery. After a few of these initial paintings were complete, Rick suggested that I paint all of them and we could have a show. I figured I'd need about two months to complete the project. So with the deadline of October 8th, I was off to the races. Little did I know that there would be over 50 paintings in the show and I would be putting the finishing touches on the final painting the morning of the 8th. 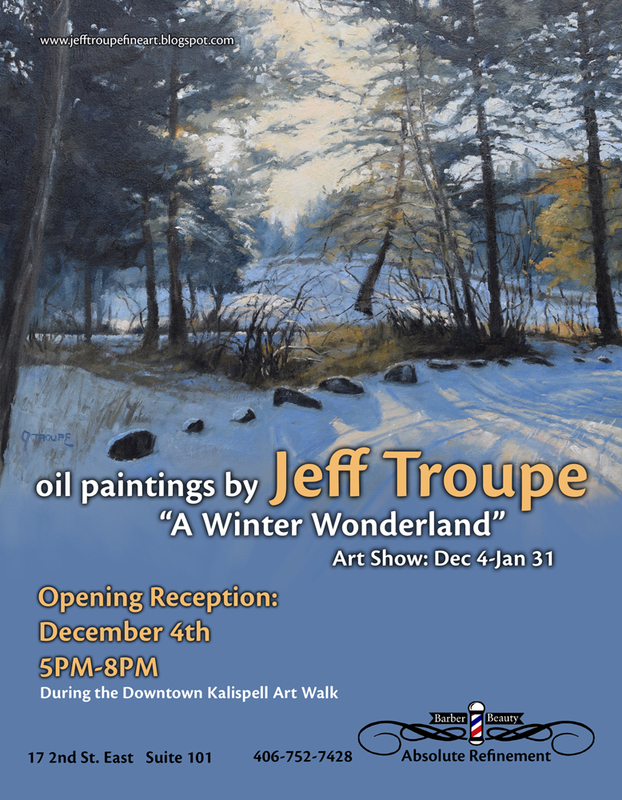 This is my latest project in which I will be painting all the local businesses on Main Street in downtown Kalispell. The idea is to have around 50 paintings ready to show at Wild Eye Artistry Gallery at 328 Main Street in Kalispell. 47 have been completed thus far. Rick Green, owner of Wild Eye Artistry, and I will have a reception for the business owners October 8th from 5pm-9pm. For everyone else, you can stop by anytime to see all the works that have been completed in person and the show will remain up until October 23th. 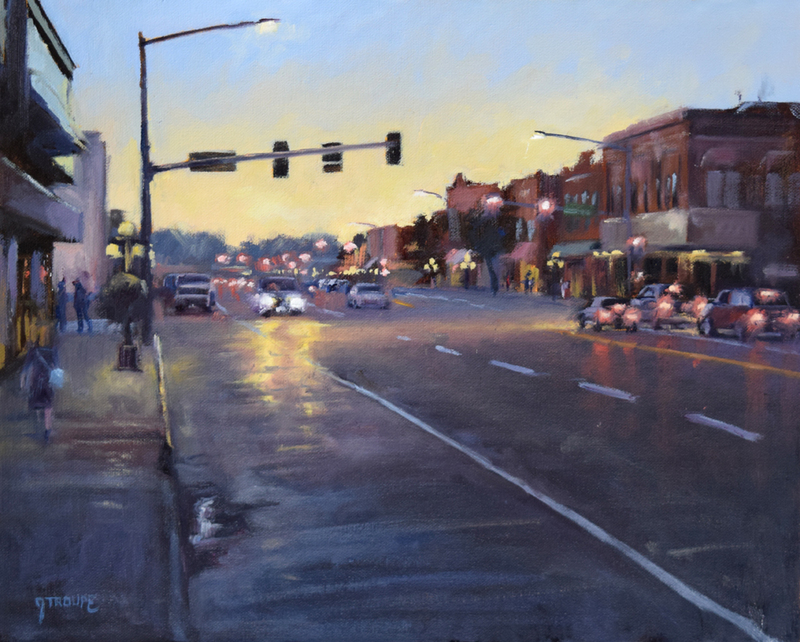 Dusk on Main, Oil on Canvas 15"x30"
This studio piece is a more fully realized version of the small study. Columns on Sixth, Oil on Canvas 10"x8"
This stately home in Kalispell's East Side, has a wonderfully charming entryway with stone columns and flower studded porch. I'm continuing along with my urban and architectural themed paintings. I'm enjoying capturing the charm that the classic downtowns of the region boast. Theatrical Color, Oil on Canvas 8"x6"
The little theater in downtown Bigfork boasts a host of colorful flowers and is decorated with several colorful posters on the exterior. 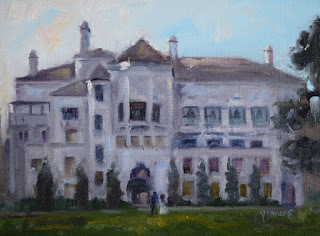 I spent a bit of time in Kalispell's classic and charming Eastside neighborhood painting more intimate portraits of the stately homes. Many were decked out with American flags and other decor in hone of Independence Day. 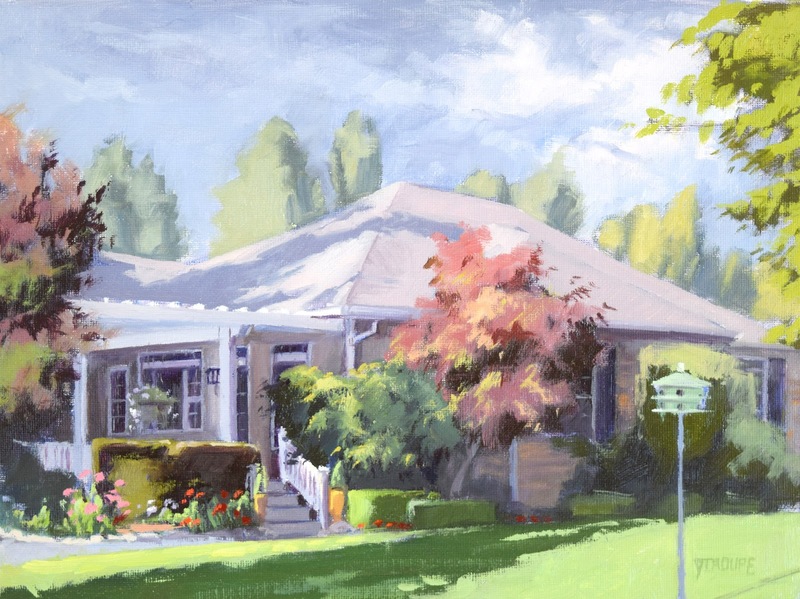 Classic Fourth, Oil on Canvas 8"x10"
The hanging basket of white flowers glowed in the mid day sun on the porch of this classic home. The days have been quite long up here in Montana with visible light present until about 10:30. The chickens have been taking full advantage of their extra daylight and have been happily exploring about. Speckles and Company, Oil on Canvas 6"x8"
Speckles and Big Brown prove to be the most personable and curious of my little flock. I have done a bit of exploring of Kalispell's East Side neighborhood during the hot weather as the large elms provided some nice shade. The spectacular Queen Anne's and other classic style homes all have a personality each their own. I have also done a few works with main street being the subject. County Lights, Oil on Canvas 8"x6"
The lights came on in the lobby of the Flathead County Courthouse as the last light of the day hit the top of the structure. I took a few days to complete a series of smaller works in the studio based on reference photos taken from the paint out in Glacier Park and specifically from the iconic Going to the Sun Road. I hope you enjoy them. Mellow Medicine, Oil on Canvas 6"x8"
The water became calm on Medicine Lake as the day drew to a close. From the shores of the Flathead river to the charming Queen Annes on the East side, Kalispell has charm in every corner. Foy's Bridge, Oil on Canvas 6"x8"
This land bridge connects Foy's Lake Rd. to a little island community in the midst of the lake. The golden light reflected its lovely orange hues off the lakes surface. 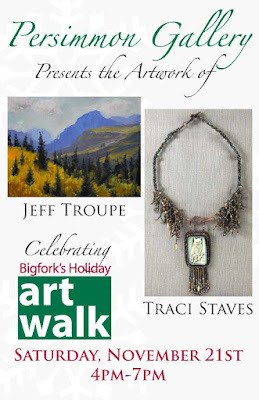 These are a collection of very small works inspired by Glacier Park. Some are plein air, while others were completed in the studio on rainy days. 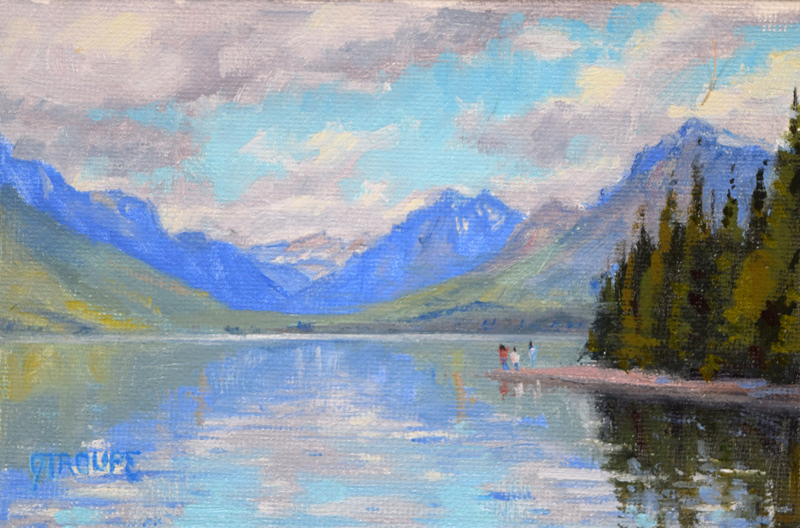 Backlit Over Glacier, Oil on Canvas 4"x6"
Lake McDonald is such a tranquil setting and this warm afternoon was no exception. These are the 11 painting I completed in plein air during the Glacier Paint out which was put on by the Hockaday Museum in Kalispell. It was such a great event and an experience of a lifetime. My goal was to push myself in regards to subject matter, size of works and exploration of the park. I am so happy with how thing turned out and I hope you enjoy the works. The Lord was with me during this time. Braving the Storm, Oil on Canvas 15"x30"
A kayaker set out on Bowman Lake just as some weather began to roll in. The sheets of rain falling in the distance was the icing on the cake for this moody scene. There are so many charming historic buildings in downtown Kalispell. It still has that quaint village feel which is lost in much of America today. 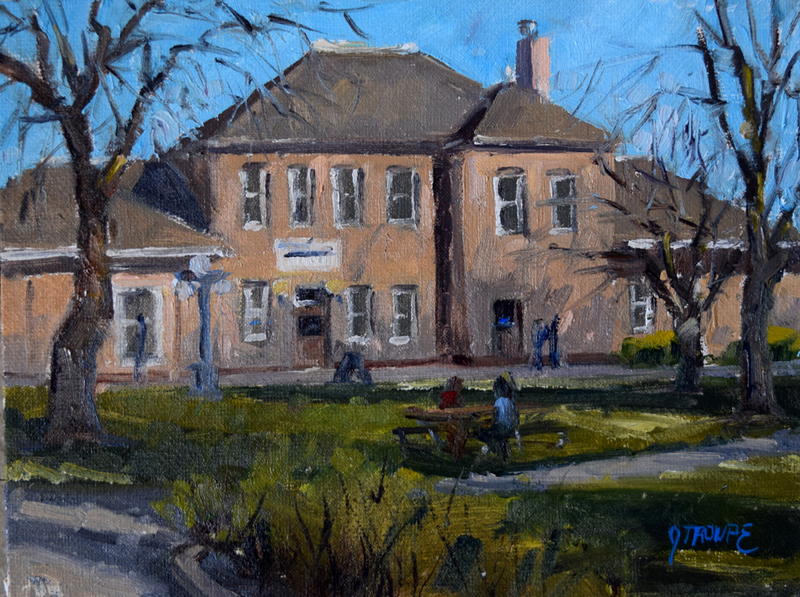 Hotel Kalispell, Oil on Canvas 9"x12"
406-314-4611I enjoyed painting this little street scene in downtown Kalispell of the historic hotel. Main Street was bustling with activity and all the flowering pots were in full bloom. 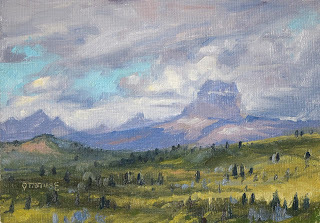 I have been making the drive up to Glacier Park to familiarize myself with the lay of the land in preparation for the upcoming plein air paint out I will be participating in. What a magnificent place. God's creation is truly marvelous. Avalanche sunbathing, Oil on Canvas 8"x10"
406-314-4611This little painting was completed just before some weather rolled in and cast the park into shadow. I really liked how the sun glinted off the surface of the water. All manner of greens are present now in Northwest Montana. From the vivid jade-like grasses to the emerald hillsides, all of which have been a joy to paint. Almost Home, Oil on Canvas 16"x20"
The red truck drove across the causeway spanning Echo Lake in the late afternoon with the Swans looming in the distance. This is one of my larger plein air pieces I've been creating recently. Here are a few quick paintings created at sunset recently I was surprised at the varying degrees of color from one day to the next. Foy's Last Light, Oil on Canvas 4"x6"
Foy's Lake is just outside out Kalispell near lone Pine State Park. The sun was lit up with wonderful warm colors during this one of a kind sunset. The hillsides and valleys are shifting to a wonderful emerald green. The days are lengthening and weather is ideal. Three painting days are becoming more common for me. Smith Valley Bales, Oil on Canvas 11"x14"
The morning light back-lit this scene in smith Valley. I was drawn to the strong silhouette of the tractor and bales and the soft light on the distant hillsides. On a glorious spring day, with temps in the low 70's, I headed up to Whitefish to explore the town and scout out a few areas for plein air painting. I was able to complete 2 studies, from which I may create larger works back in the studio. MacDonald Reflections, Oil on Canvas 6"x8"
It was a pristine, crystal clear day in Glacier Park on the shores of Lake MacDonald. The lake reflected the mountains and sky as a mirror. I greatly enjoy watching my little flock of chickens forage throughout the yard. They are always so active and alert and I wanted to do a couple of studies that captured this energy. Feeding Time, Oil on Canvas 8"x6"
406-837-2288The little flock waited patiently for any table scraps I might throw their way.